Awesome family. Even asked me what time I wanted breakfast. Customized the whole experience for me. Highly recommend. A very nice family run hostel. It was great value. I was very satisfied with my room and hot shower after a few nights in Quilotoa with no water. This place was pretty luxurious for the price. Friendly people. Good breakfast. Good location, quiet but still close to town centre. I would definitely recommend it. Great hostel! Very clean and the breakfast is amazing! Fresh 100% fruit juice, great artisan bread with butter and homemade jam, scrambled eggs and coffee. This is a family run hostel which was perfect for us but not your best choice if you are looking for a party atmosphere. They also run a travel agency and rent great quality bikes to go to Pailón del Diablo (which we did), either with or without guide. We went on a day trip with Saúl to the Amazonia and it was amazing. Highly recommended! I really enjoyed my stay at Casa Amarilla City. Darwin and his family were very friendly, helpful and hospitable especially his mom and dad and his sister who made me some soothing oregano tea when I was having some stomach troubles. Had a nice stay at hostal amarilla City in Baños. Clean rooms, good homemade breakfast. The owners were great to chat with and really made this place special. We rented their bikes for a day to check out the waterfalls. Would definitely stay again! I believe this only has private rooms so not really a place to meet people but that made it fairly quiet at night. And the bed was comfy. We stayed at Casa Amarilla City for 2 nights while we were in Banos. It's a family run Hostal, and Darwin and Saul were great. They always made sure we were happy with everything and did their best to help us find something to do when our rainforest tour got canceled because of the non-stop rain. Only downside was that we only got 5 minutes of hot water during our showers... Didn't bother us too much though as we take short showers anyway! We enjoyed our stay at Casa Amarillo. The breakfast was simple but nice and plentiful. The room and ensuite were comfortable and satisfactory. The only window opened into the hallway which picked up a bit of noise and light. 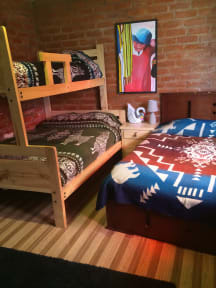 The hostel is family run and located within walking distance to bus station, restaurants and shops. 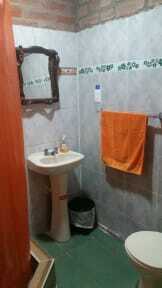 You can organise tours and activities from the hostel as well as laundry. If you are looking for a quiet and not a party hostel then this is the place. Would recommend. Lovely relaxing stay. Staff were very helpful. We checked out and went to do activities and they allowed us to use the showers that evening despite being checked out. You can also organise activities in the hostel which is useful. Rooms are spacious beds are very comfortable. WiFi could be better. Overall this is an excellent hostel.